A highly detailed cottage that will fit into many historic periods as an excellent terrrain piece. It is a great example of the 10th century development from the Saxon dwelling into the high medieval cottage with its loft room; though this building would have not been that uncommon as a rural dwelling during the Civil Wars of the 17th century. It still retains the smoke-hole gable, the through doors each side and a central firepit. 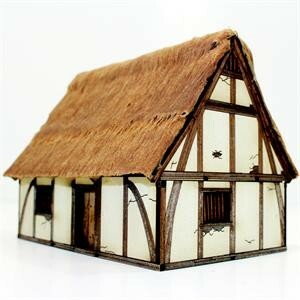 This laser cut model kit is supplied pre-painted with 4Ground base paints, even the thatch fabric for the roof is included, along with doors, firepit, loft with loft ladder and wooden mullioned windows.